Along with its standard pop-up hood, the new BMW 7 series has a pedestrian warning system, which is part of the cars optional night-vision package. Automakers and suppliers are responding to pressure to make new cars less dangerous to pedestrians and cyclists. Tougher rules for pedestrian protection take effect in four years. In addition, starting next year EuroNCAP will deny a car the independent car-testing organizations coveted five-star safety score if the model does a poor job protecting people from injury or death if hit by a car. To comply with the tougher rules automakers are redesigning the front-ends of their cars and using solutions from suppliers such as Autoliv of Sweden, Robert Bosch and Continental of Germany, and IEE of Luxembourg. The protective systems vary from pedestrian-friendly bumpers and hoods to pop-up hoods to electronic sensors that detect a person in the roadway and warn the driver. The aim of future systems is to stop the car before it hits a pedestrian. In a report done in 2005, automotive industry analysts Frost & Sullivan forecast that 50 percent of vehicles in the premium segment would have pedestrian warning systems in place by 2010. By 2015, one-quarter of all cars will have such systems, the analysts forecast. Frost & Sullivan Global Director of Research Anil Valsan said late last month that the firm still expects strong uptake for the systems. But he said it will take longer to reach the levels previously predicted because of the drastic changes automakers are making to their product plans. Because head injuries from contact with the car hood, windshield and A-pillar are a major cause of pedestrian deaths, many mass-market brands are designing more energy absorbing space into the area between the front grille and the engine compartment. While it is complex, doing the redesign is more affordable than the alternatives, said Takoshi Yamamoto, chief engineer of Toyotas new Avensis. It requires extra design and engineering efforts but as long as you do not apply so-called active hoods, pedestrian safety measurements are not very costly, Yamamoto said. Europes pedestrian protection rules were adopted in 2003 and took effect two years later. They require that the front ends of new cars are less dangerous to pedestrians. That means hoods and bumpers must be designed to absorb more of the impact if a person and a car collide. The rules are part of the EUs aim to reduce the number of annual road fatalities to 25,000 by 2010 from 50,000 in 2001. About 8,000 pedestrians and cyclists are killed and 300,000 injured each year in road accidents, according to the EU. 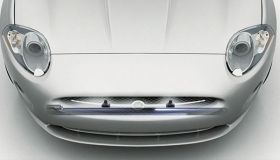 If the Jaguar XFs bumper sensors detect a pedestrian is about to be hit, they send a signal that causes the back of the hood to rise using pyrotechnics. Many premium brands, including Mercedes, are choosing to use pop-up hoods, because they reduce head injuries by 30 percent, according to industry experts. Media reports say that the next Mercedes E class, due later this year, will have a hood that pops up 50mm in the event of an accident with a cyclist or pedestrian. To meet EU standards, there must be a total of 80mm between the hood and the hard, injury-causing components under it. The E class will join the Jaguar XK and XF, Citroen C6, Honda Legend and BMW 7 series as models with pop-up hoods. The XK and XF have systems from Autoliv. The Honda Legends system was designed in-house. The C6s system comes from French conglomerate SPRIA with help from sensor supplier ACTS. The hoods are costly because they need a pyrotechnic system to get them to rise as well as electronic sensors that use complex detection software to calculate when to activate the hood. Such software and detection systems account for half the cost of an active-hood system, Autoliv spokesman Hendrik Kar said. Suppliers and automakers declined to reveal the price of an active hood system, but industry sources say that they cost the automaker between 350 and 500 a car. CSM Worldwide analyst Richard Buitendijk said he expects the systems will remain mostly on high-end cars because of their cost. Autoliv expects the cost of active hood to fall once pyrotechnic activation systems can be replaced by a simpler spring systems. 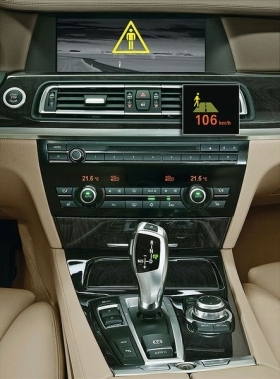 Along with its standard pop-up hood, the 7 series also has an Autoliv-sourced pedestrian warning system, which is part of the cars optional night-vision package that costs the customer about 2,000. Using a grille-mounted high-resolution infrared camera, a computer alerts the driver that there are pedestrians at risk of being hit by the vehicle. The new E class also will have a pedestrian warning system. Bosch is the supplier. The next steps are systems that can avoid hitting pedestrians or reduce the impact speed if the driver doesnt slow down enough. Volvos S60 concept, which debuts at next weeks Detroit auto show, can come to a stop before hitting a pedestrian. It does this with the help of the next-generation of Volvos so-called City Safety crash avoidance system. We use more advanced radar and cameras with a wider angle so that we are now pretty sure that a car is nearing a pedestrian and not another object like a car or light post, Anders Eugensson, Volvos safety expert for governmental relations, said.